Gold at last, thank God and Kiprotich, Uganda has got another Olympic Gold medal. It was in 1972 when John Akii Bua won the first gold medal for Uganda at the Munich Olympics in the 400m hurdles. But it was not just another regular winning. This young Ugandan had broken a world record and also the first man to break the 48 seconds barrier in the 400 meter hurdles, in addition, he was the first African man to win a gold in any Olympic sport under 800m. It has taken 40 years for Uganda to get another Olympic gold medal. What happened, many may ask. However, it may be easier to talk about what didn’t and hasn’t happened since then. In fact it can be summed up in three words: “Lack of investment”. However, I will first shed light on Uganda’s accomplishment in Olympics. While most of us have heard of John Akii Bua, there were others before him that we don’t hear much of. Uganda first participated at the Olympic Games in 1956, six years before independence. Eridari Mukwanga (12 July 1943 – 1997) and Rwabwogo (June 3, 1949 – January 14, 2009) were the first Ugandans to win Olympic medals, silver and bronze – respectively, in boxing at the 1968 Summer Olympics in Mexico City. 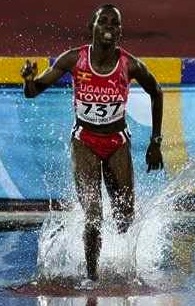 Leo Rwabwogo won a silver Olympic medal in 1972, the only Ugandan who has won more than one Olympic medal. 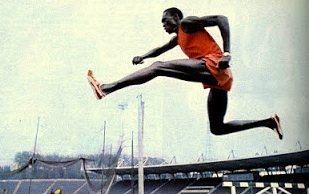 John Akii Bua at the Munich Olympics of 1972. John “The Beast” Mugabi (born March 4, 1960) won a silver medal in 1980 at Moscow-Russia games in boxing. Davis Kamoga (born July 17, 1968) won the bronze medal in 400m at the 1996 Summer Olympics in Atlanta, Georgia. Davis Kamoga’s personal best time of 44.37 seconds in 1997 World Championships in Athens ranks him fourth of all time in Africa . “Sports investment” is not easily defined unlike Finance investment – witch is putting money into something with the expectation of gain. In Uganda, we hear a lot of how important “Business Investors” are to the economy, hence the reason to attract foreign business investors. But we never hear of “Sports investors” being sought and given incentives that business investors command. This is because “Sports investment”, unlike business, is mainly done by the governments and unlike finance investment, the returns are not measured in monetary gains. You have heard that money is not everything; this may be the golden rule in Olympics, however don’t be deceived, in addition to hard work – it takes money to turn a young talent into an Olympian, and much so to win medals. It starts in primary schools by including physical education in school curriculums and then financially funding sports programs and competitions on regional and national levels. Building infrastructure and facilities that are needed. You don’t become Michael Phelps without access to a swimming pool. Uganda and most African countries don’t invest enough in sports. In addition, there is mismanagement beyond reason. The story titled “Olympics: Kamoga stranded in London -Publish Date: Aug 01, 2012” in Newvision paper sums it all. How does a Uganda’s Atlanta 1996 Olympics hero Davis Kamoga sent to motivate athletes get to be stranded in London for lack of money to buy food to the extent of demanding to be flown back home during Olympics come to be? What kind of motivation does he give to others when he is being totally frustrated himself. Then another sad story is of Uganda’s Dorcus Inzikuru – Aug 4, 2012. She finished London Olympics steeplechase race in the seventh position with one of her shoes flat because it had lost its spikes. Just a few years before, this is the same woman who had won the inaugural female 3000m steeplechase competition at the 2005 IAAF World Championships in Helsinki, Finland. While some papers had Inzikuru on front page with statements such as: “Dorcus Inzikuru neither needs motivation nor introduction at this stage. She is a gold medalist at a world championship”, none knew that she struggled financially and did not have adequate shoes to train in. It is reported that when she arrived in London, that is when she bought herself a pair of new running shoes. Having said all that, let us celebrate with Stephen Kiprotich this historic achievement; what an inspiration to Ugandans! Kiprotich of Uganda wins marathon gold in 2hrs 8min 01sec. This 23 year old Ugandan was born on 27 February, 1989, Cheptiyal village, Kapchorwa District. People from Kapchorwa are well known for their athletic abilities. Kiprotich was a good athlete from his early childhood through collage. But, he decided to leave Uganda to train for the 2012 London Olympics with world class marathoners in Kapsabet Kenya highlands. No one not even Kiprotich expected to beat the Kenyans, especially Abel Kirui, a two-time world champion, who took silver. 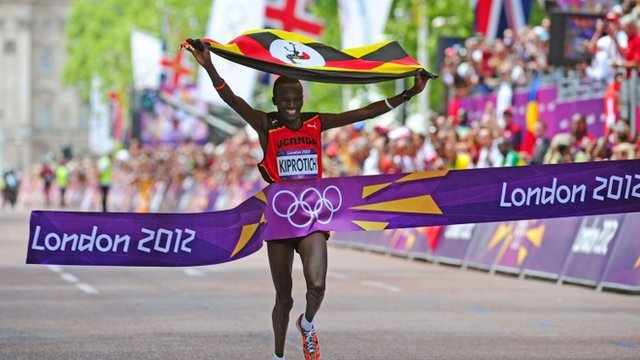 Kiprotich said he just went to London Olympics to do his best, and best he was – clocking 2hr, 8min and 1 second. He run a smart race, staying behind the two well known world marathoners, but not too far to catch up when it mattered most. At 35km (21.75ml), he was 1:46:04 just 1 second behind Abel Kirui and Wilson Kipsang of Kenya. At 40km (24.85ml) he was 2:01:12 ahead of Abei Kirui, 19 sec. at 2:01:31 ahead of Wilson Kipsang 51 sec. at 2:02:03. In the end, Kiprotich had a clear lead, enough to allow him time to grab the colorful Ugandan flag as he approached the finishing line, which he joyfully held above his head with a big smile; there could not have been a more perfect picture than that. Abel Kirui out of the picture, 26 seconds behind, as he crossed the 26.2mile line. Congratulations once again Mr. Kiprotich. While many had not heard of Joseph Kiprotich until today, he is known in Uganda as a well rounded athlete who has won several competition in 3000m, 5000m, 10,000m, 3000m Steeplechase, Cross Country going way back to his secondary school days in Kapchorwa Secondary School and Sebei College.